Internet, January 29th, 2018. 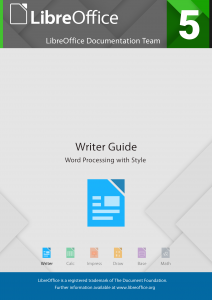 The LibreOffice documentation community is pleased to announce the immediate availability of the Writer Guide 5.4, with all innovations and enhancements of LibreOffice 5.4. The guide is an in-depth reorganization and revision of the Writer Guide 4.2. The work was lead by Jean Hollis Weber, with collaboration from Cathy Crumbley and Bruce Byfield. The book is targeted to end users, who look for advanced techniques for contents production, maintainability and update of text documents, unleashing the full power of a leading edge, solid word processor. Thankyou!! At last. I’ve missed this Guide a LOT.